The smell of fresh firewood burning is one of the most nostalgic smells for me. It instantly evokes my childhood, camping and fun. So when I heard that renowned folk music impresarios the Nest Collective, led by the Mercury Prize-nominated musician Sam Lee, had started a Campfire Club, it immediately captured my imagination and I made sure to join them at their next event. 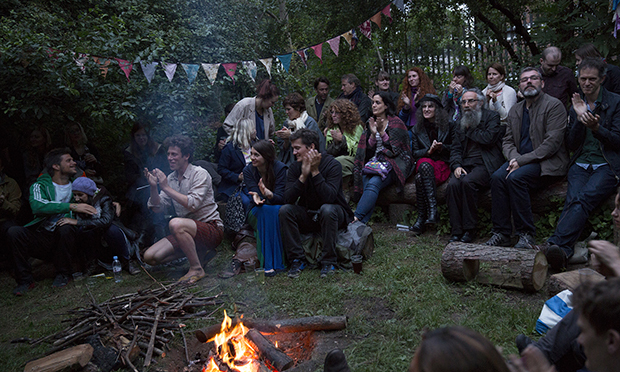 The Campfire Club is hosted by art and botany project Phytology in the Bethnal Green Nature Reserve throughout the summer. According to records, the location was a market and nursery gardens in medieval times, and in 1846 a church with active social functions was erected there before being totally destroyed in the Blitz. “The land was left dormant for 50 years and only just being used as a community space” explains Lee. On entering the nature reserve for the first time, I was invited to take a seat on the log benches of this intimate amphitheatre. Without amplification, the performers began to sing by the fire and their voices sounded timid. The sounds of the city seemed to override theirs: people talking in the street and cars passing with their horns sounding, constantly reminded me I was in East London. But as the sun set and the night came, I leaned closer to the fire, and listened better. The city seemed to have calmed down and the performers’ voices became more audible. By that point I was captivated by the music, mesmerised by the flickering flames and – just as I was as a child – enchanted by the smell of the wood smoke.